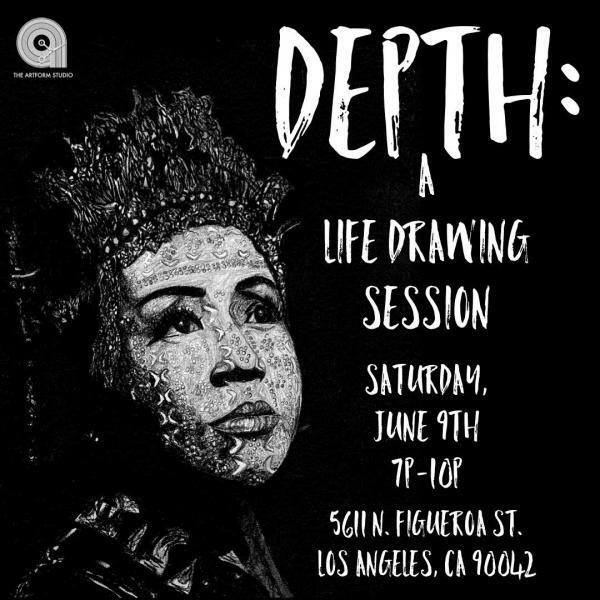 LOS ANGELES, CA – (June 1, 2018) – The Artform Studio, Highland Park’s premier hair salon and record store, announced its monthly DEPTH: A Life Drawing Session hosted by Artform Artist, Jazmin Hicks, happening on Saturday, June 9th, 2018 at 7pm. This month features our live muse Aqulina Soriano, one of the founders and Executive Directors of the Pilipino Workers Center. Jazmin Hicks created DEPTH as a community event with the intent to celebrate culture, raise awareness, and give back to non-profit organizations. Find us on Twitter at @ArtformStudioLA , Facebook.com/ArtformLA , and Instagram at @the_artform_studio . Join the conversation by using the #TheArtformStudio and #DEPTHatArtform . For Press Credentials, please contact Amanda Wright. Jazmin Hicks is a self-taught visual artist and photographer based in the Los Angeles area. She has worked with The Artform Studio for three years now as a Creative Director and photographer putting together monthly events, ad campaigns, and photo series. Jazmin’s artwork has been showcased throughout Los Angeles at The Artform Studio, Buckwild Art Gallery, Baldwin Hills Crenshaw plaza, and published in LA Art News. She has studied photography under German photographer Ingrid Hertfelder working on projects with Marcus Miller, Reginald Hudlin,Kelly McCreary, The Miles Electric Band, and Bryron Miller. Pilipino Workers Center is a non-profit organization located in Historic Filipintotown Los Angeles, but serves Filipino’s throughout Southern California. PWC works to serve victims of wage theft, human trafficking, and occupational safety hazards, with the goal of ensuring Filipino immigrants the right to a dignified quality of life. Aqulina Soriano has served as Executive Director of PWC for 17 years and has been working in the Pilipino community for 22 years, both here in Los Angeles and in the Philippines. She has been at the head of PWC as it has been a part of the growing statewide and national movement of domestic workers. She studied her BA in Asian American Studies at the University of California, Los Angeles. A mother of two, she sees her work for social justice as a life long endeavor that she hopes to pass on to her daughters.